Paint, Pigs, Primroses… and soup! It is Easter this weekend. Holy Week, Passover, Spring! Suddenly winter is behind us and we’re racing into Spring. It all seems to happen over night, one minute we’re bracing ourselves against wind and rain, sliding around in the mud as we struggle up to the farmyard and the next minute the clocks change the evenings are lighter and we’re plunged into the new season. We’re awash with flowers, singing birds, trees with buds bursting, ewes fussing over their lambs, ducks shouting on the mill pond. And everyone’s in a hurry! Seeds are germinating and begging to be pricked out, flowerbeds need digging, vegetables need planting and all I can do is paint paint paint the holiday cottage in time for the first summer visitors on Friday, Good Friday. The winter tenant left it perfect but the time has come for a new coat of paint, and, oh, how I hate being trapped inside with a paint brush in my hand when the sun shines! And I had my best ever phone message yesterday, did I have some eggs that the children could hatch over Easter and then give me back the chicks on their return to London…..birds and bees? 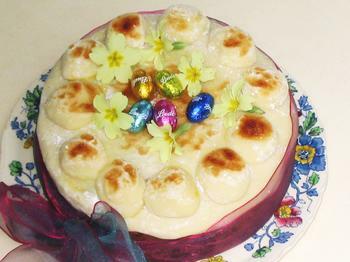 Simnel Cake with 11 Marzipan Apostles (no Judas) and Primroses. 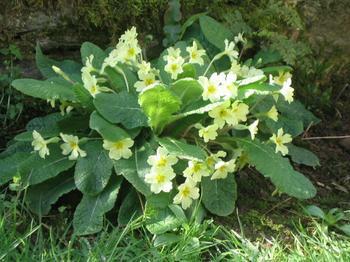 Simnel Cake was originally baked for Mothering Sunday but has now become associated with Easter. Violet Ice Cream: Dorothy Hartley’s recipe is so simple. Add as much fine fresh brown bread crumbs to a bowl of whipped cream “as it will carry“, freeze a little. Stir in coarse sugar or crushed sugar candy. The sugar must be course, she insists. Chill again. Cover “lavishly” with crystallised violets, chill and serve. My version is almost the same but I find stiffly whipped egg white lightens the texture. Experiment and see which you prefer. The easiest way to crystallize flowers is to dip them in lightly beaten egg white, shake of the excess, place gently of a wire wrack and sprinkle with icing sugar, allow to dry. The flowers are so fragile it’s a delicate business. Don’t try it if you’re in a hurry!